Do you experience back pain or neck pain as you work at the computer? This might be the result of how you sit and how you move. If this is the problem, I can teach you to use the principles of the Alexander Technique to become aware of what you are doing and change your habits. Have you hit a plateau in your performance skills? Are you stuck at a certain level in your sport, singing, or musical instrument? Lessons in the Alexander Technique teach you to change your old habits, get un-stuck, and take your skills to the next level. Do you feel un-coordinated and lacking in poise when you walk? Do you slump uncomfortably as you sit? You can use the Alexander Technique to improve your posture and coordination in movement for better balance, poise, and ease in everyday activity. 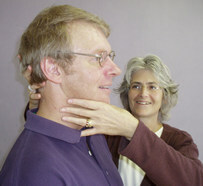 Call Phyllis Richmond at 214-769-4502 to discuss how learning the Alexander Technique could help you.